You saw the ads this weekend, right? I mean, we don’t even have cable anymore and the streaming services we use thatÂ do have commercials were playing that Home Depot commercial into the ground! When we moved into the Dollhouse, it was our understanding that the dishwasher, while noisy and in need of a good cleaning, ultimately worked. We knew it would most likely be the first appliance we replaced, but figured we could put up with a bit of noise for the sake of convenience for a little while. 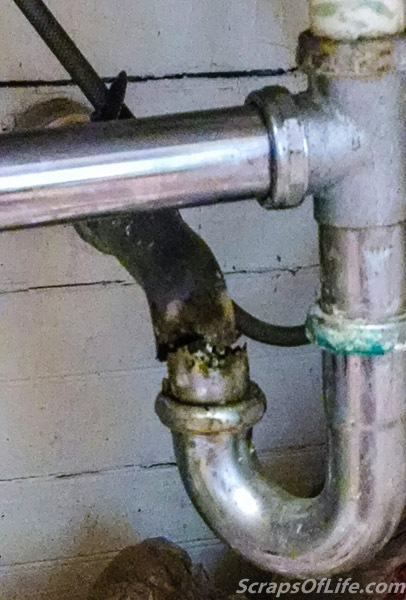 Oh, sure, it made noise, but that’s about all it did.Â At first we thought it might be an issue with the water line, but there didn’t appear to be anything wrong with the water line. Instead, it appeared that the machine wasn’t pulling the water into the working bit, preferring just to grind its way along doing a whole lotta nuthin’. So, about a week after we moved in, I started researching our options. 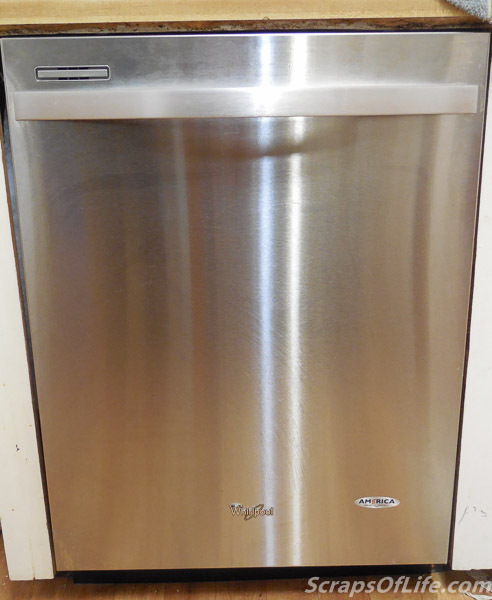 Since it was around the 4th of July, we were able to get a good price (about a third off) on a very pretty stainless steel, super-quiet number with lots of options on its hidden control panel. And came back to this…. And when I say it’s quiet, I mean you can barely hear it running, just the gentlest woosh woosh of the water in the tank. Of course, no good deed goes unpunished: we reward the Dollhouse with a new appliance and, in the process of installing it, the pipes under the sink practically disintegrate. Thank goodness Todd is handier than the average bear! After a year of use, we’ve only run into two issues with our Whirlpool Gold 55-Decibel Built-In Dishwasher: the “dew” it left on dishes and the musty smell it’s started to develop. 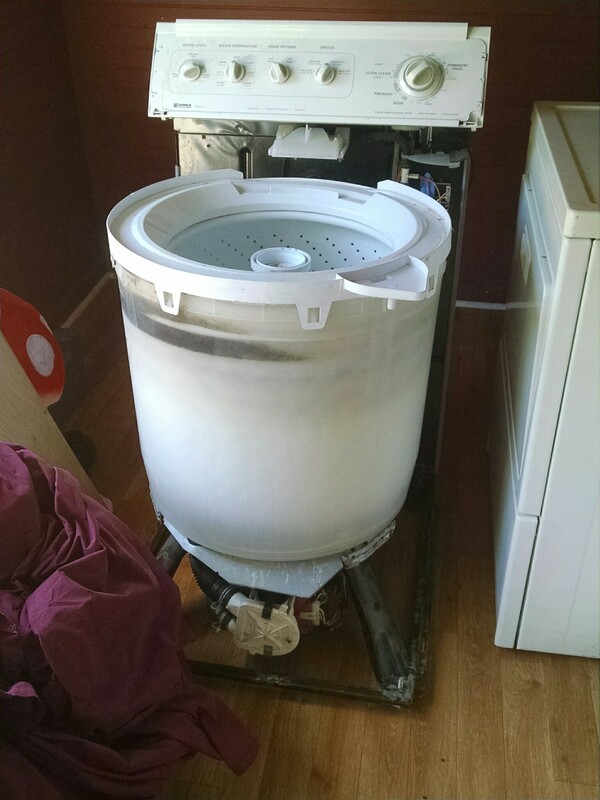 The first, we found, was easily fixed by feeding it a rinse agent–something that’s pretty much a necessity of all newer machines and an easy fix. (We also learned that you can dial up or down how much rinse aid is dispensed with each wash so you’re not wasting any of it, though a single bottle has lasted us quite a while.) The other problem is fixed by running a cleaning agent through an empty cycle, but I’m still on the hunt for one that doesn’t leave a noxious, overly-chemical after-smell in its wake. First world problems, indeed. After 9 years and not quite 2 months after its 3rd move, an old friend was DNR once day when we got home. At first we thought the power had just gone out and the panel needed resetting, but it turned out the microwave was just completely kaput. Sure, it’d been giving us signals that the end was near for a while: occasionally only certain buttons would work, that sort of thing. Considering more meals than not involve vegetables steamed in the microwave (using the amazing Tupperware 3-piece steamer–so worth sitting through the party spiel), this was bad news bears for us, and we immediately headed to Lowe’s before they closed that night to find a replacement. We had a few important requirements: large capacity, stainless steel, and good options buttons. The GE microwave we ended up with (pickings were slim and it wasÂ not an Appliance Holiday) does a really good job of being annoying if you don’t rescue your food after the first ding, but it also has an amazing potato setting that really does produce fluffy “baked” potatoes in less than 10 minutes and without heating up the surrounding area! At first we thought it was possessed, though, because we unboxed it, plugged it in, and it turned on. And I don’t mean its display lit up and asked for the clock to be set, no–its interior light turned on and the turntable started spinning and it wouldÂ not respond to any of its buttons! Must of been a loose something or other, though, because we tried it on another outlet and it worked fine. So we put it back in the designated microwave spot and it bahaved like a stainless steel gentleman. As we were gearing up for our first Halloween (and party) in the Dollhouse, another appliance was ready to give up the ghost! 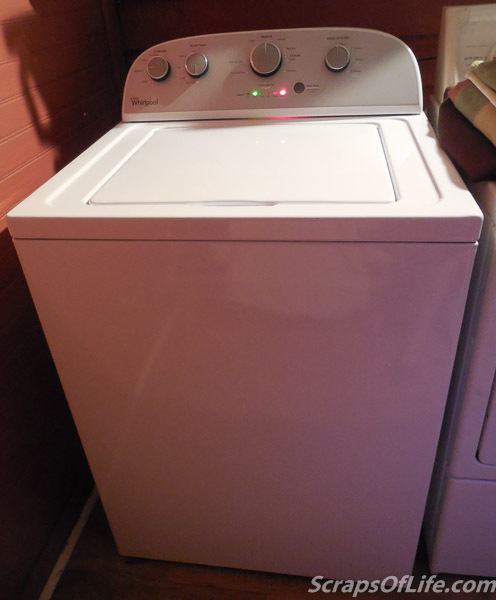 Our washing machine, which I’d purchased, used, along with its dryer when we moved into the Thresher house back in the winter of 2010 for a whopping $411, was having trouble completing the spin cycle to our satisfaction. We limped it along by sticking to extra small loads and wringing the heavier garments out by hand before putting them in the dryer, but it was beyond Todd’s fix-it capabilities, requiring a new motor–a part more than the machine was worth, at this point. And, thanks to the happiness that is Lowe’s free haul-away, I can home to this! Though this is a much more recent picture, I believe Todd had the new washer going by the time I got home that day, too! So, while we aren’t looking to take advantage of the current sales *knock on wood*, we do appreciate the opportunity to window shop (lawnmower, I’m looking at you, shape up–we have no time for your shenanigans and the grass is getting tall out back!). And I wish each and every one of you, out there, that you may only need to make those big purchases during the Appliance Holidays in the future! 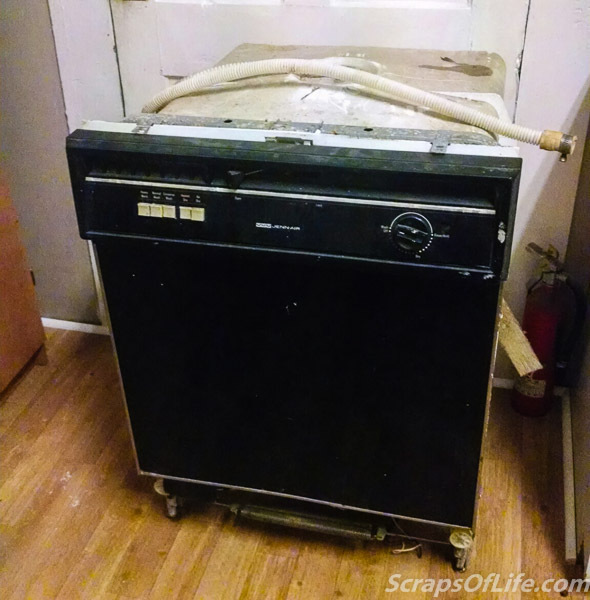 I love a good appliance story (or several)! It has taken me a bit to get used to the locking lid on our top loader, too (was also not at all interested in a front-loader — no thanks!) — funny how the simplest “safety precautions” take the most getting used to. I feel like a throwback to the 50s housewife every time I wax rhapsodic over how much I love our dishwasher, but I do it anyway, lol.